Did you have a dream about a horse and wondering what it means? If you had a dream about horses, it can mean a number of different things. The interpretation of these dream will mostly depend on how the horse appeared in your dream and your own personal associations with horses. Horses are a very important animal in our lives. We would never be where we were today if it weren't for horses! They were first domesticated by humans in 4,000 BC. We often associate horses with farms, racing, transportation - many horses appeared in history through war and battles. When you dream about a horse, it is helpful to think about the other dream symbols that might be present in the dream. As you can imagine, it is very different to dream of a cowboy riding a horse running from the law through the wild west than to dream of a peaceful white horse drinking at a stream in the forest. While the events of the dream may influence the overall dream analysis, when we see a horse in our dreams there are often some common themes present. Horses can appear in our lives as dream symbols, or even as synchronicities in our daily waking lives. 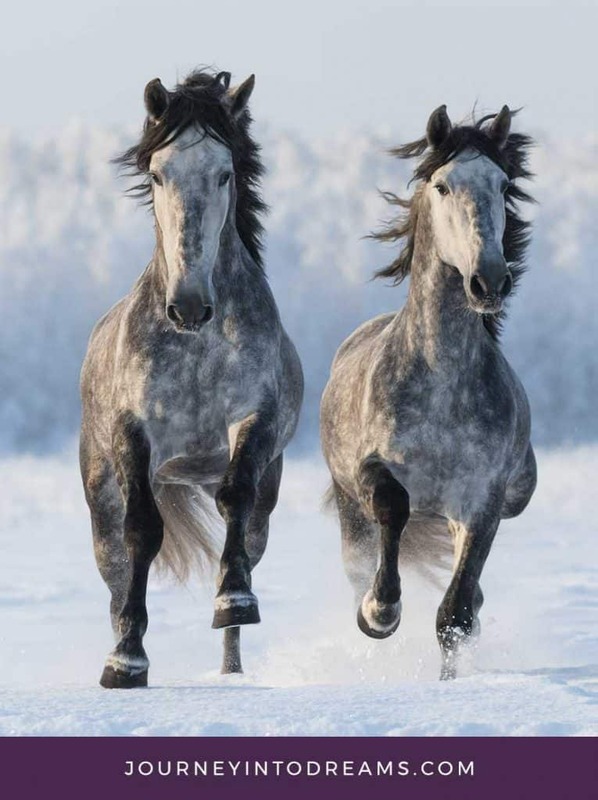 You may feel connected to the horse as a spirit animal, or a horse may appear as a power animal to support you and give you guidance through a situation in your life. We often associate horses as being very powerful animals. They are able to carry the person who rides them, along with being able to pull carts, wagons, plows, and more. There is a reason that when we talk about motorized engines they use the word "horsepower"! 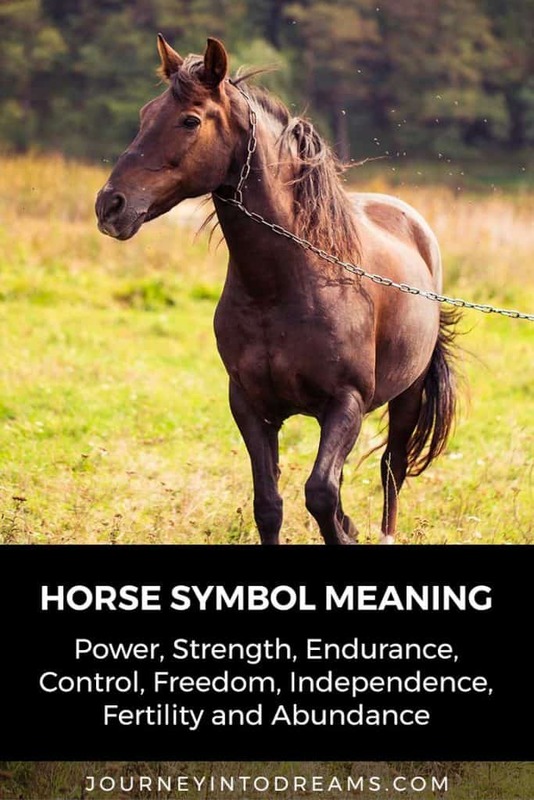 Horses can be a sign that you are stepping into a role that may require great strength of character - or it can mean that you are feeling like someone is draining you of your energy. If you dream of a horse, you will definitely want to think about your own personal energy. Do you feel like you are full of energy and that your life is in a good balance? Or is there something that is making you feel tired and worn out? Because these animals are so strong and powerful, it is not uncommon for one to appear when one does a power retrieval or soul retrieval. These animals give us the wisdom to find our own strength from within ourselves and to stay strong in the face of any challenges. Horses are able to work for long hours and even in difficult weather and climate conditions that some people would not be able to tolerate at all. Again, there is a reason why someone would use the expression "a real workhorse". Sometimes the horse comes to us in dreams or other signs to help us understand the type of work we may be doing in our lives. It can also be a beacon to give us hope - that through patience and persistence, we will be able to overcome our current struggles and challenges in life. Sometimes a horse may come as a symbol of being very independent and free in life. Wild horses are horses which have not been domesticated, and they are natural occurences in many areas of the world. One such example of wild horses in America are the Horses of Assateague Island. If horses appear in your dreams and there are not other people present, it is quite likely that this is a dream concerning your own independence or free spirited personality. Sometimes being a free spirit can be a great strength - other times it can cause us problems in getting along with others who are a bit more traditional in their views. Horses are known to be temperamental and moody mothers, though most people often associate the horse with masculine energy because of the symbol of a stallion. We know that manure can be very good as a fertilizer for our plants, so it is not surprising then that this would be a symbol of fertility and abundance. For some, a horse is considered to be a status symbol, much like driving an expensive car or living in a mansion. We often associate these animals with the wealthy and powerful, such as Royal Families who have servants or those with authority, such as a General in war. You may be dreaming of this horse because you are feeling powerless about your financial situation, or you are working to improve your current finances. Since horses may appear in your dream in many different ways, it helps to think about your own personal associations and experiences with horses. For example, if you currently own horses or used to live somewhere where horses were common, the dream may mean something different to you than if you don't have much personal experience with horses. Dreaming of Horseback Riding: In most cases, when you dream of riding a horse this is a metaphor for how you are currently "trotting along" in life. You may want to look at the meaning of roads in dreams, as this could sometimes be related to your life path or work. Your own personal feelings about horseback riding and the mood of the dream may provide additional clues to what this dream means for you. Saddle & Tack: These things in dreams can sometimes be a symbol of status and wealth or power and dominance. If you dream your horse is missing these things, it could mean you are feeling unprepared for a situation in your life, depending the context of the dream. Other People Riding Horses: If you dream of someone else or a group of other people riding a horse, this often means that you are concerned about how others are working along together or how their energy affects you in life or your career. Dreaming of a Race Horse: Race horses will typically mean you are competitive and or in a rush when they appear in dreams. You may be working towards a current goal. You may be working to overcome some obstacles and hurdles in your life. If the dream takes place at a racetrack or other similar large public venue, you may wish to also look at the dream meaning of arena. Horse Pulling a Buggy, Carriage or Wagon: You may be feeling like you do all the work for a friend who does not appreciate you. It could also mean that you have a lot of responsibilities in life. If you are dreaming about going somewhere in a wagon or carriage, you may also want to look into the meaning of vehicle. This could also be a symbol for the work and effort necessary to maintain and create relationships in your life. This is especially true if this might relate to other people who are in the wagon or carriage. Pulling a Plow or Plowing a Field: Often times this plow in a field could symbolize that you are looking at your choices in work or your career. It could mean that you long to live a simpler and slower lifestyle. It could also be related to preparing for a new project. You may also want to look at the dream meaning of gardens for more clues to what this may symbolize in your life. Wild Horses: Dreaming of wild horses often denotes your own feelings of power and strength in a situation. Do you feel as if someone might be trying to control you? Do you feel as if maybe your own emotions are out of control? You may also want to consider different songs you have heard or books you have read. For example, Rolling Stones has a song called "Wild Horses" that brings up a lot of personal memories and feelings from my life. Dream of a Horse and Water: There is an expression, "You Can Lead a Horse to Water, but You Can't Make Them Drink". This expression means just because someone has what they need available to them, does not mean they will always do what is best. We do not always have control over a situation! Water in our dreams typically represents our emotions and feelings. Seeing a horse with water in a dream may symbolize that you are feeling energetically drained. You might be feeling that your emotions are wild and out of control. It could also pertain to some feelings and emotions you have about your current work or career. Mare & Foal: Dreaming of a mother and her baby can mean that you are feeling mothered in some situation in your life, or that someone is controlling you or treating you as an infant. Mares are known to be very temperamental mothers, often going from sweet to sour with little notice. Dreaming of Snow: If you dream of horses pulling a sleigh or in a field covered in snow, you may also want to look at the meaning of snow in dreams. Dreaming of a High Horse: Have you ever heard of the expression "on a high horse"? This expression typically relates to someone being arrogant and egotistical. It could mean there is someone who feels like they are better than you, or someone is making you feel bad about yourself. Dreaming of a Horse Talking: There are a few different sayings about horses that could apply here to what this might mean. There is the expression, "Straight From the Horses Mouth", which means it is from a trusted person of authority. In this case, what is being communicated is believed to be true. However, there is also the expression "Horsefeathers!" which means to be outlandish, impossible, unbelievable or exaggerated. Horse Teeth: Horse have large teeth, and so you may dream that you have bitten by a horse. Sometimes this could be a mental reference to the expression, "a hair of the horse that bit him" which means to get revenge or recover from a hangover. See meaning of teeth in dreams - and then ask yourself how the meaning of teeth may be related to your feelings of power, strength, control or freedom. Eating horse meat: In many parts of the world, horsemeat can be found on the menu. However, in countries such as United States, United Kingdom, and Ireland, there are many restrictions and it is seen as something wrong, even though the U.S. exports horse meat to other countries for food. You may want to look at the meaning of eating - and think about your feelings. Did you feel guilty or horrible that you ate the horsemeat? This dream may symbolize doing something taboo or feeling guilt over something you have done or are thinking about doing that is questionable to others. Dead Horse in Dreams: "Beating a dead horse" is another common expression to consider if you dream of an injured or dead animal in your dream. This most likely relates to your own energy in a situation - you may feel like you simply cannot keep going on like you have been and are ready for change. See death and dying dream symbol meaning to understand this instance in more detail. Dreaming of Manure: Manure is often used as a fertilizer, and for this reason in dreams this can sometimes be associated with fertility and abundance in life. Dreaming of manure could mean you have some fears or negative feelings about wealth and the material aspect of life. This can be a sign that there is something bothering you about the physical world or that you feel as if you are not where you want to be financially. Flying Horses: A flying horse is most often associated with the symbol of the Pegasus. This dream could symbolize the power of your ideas or that you are experiencing wishful and unrealistic thinking. Dreaming of a Trojan Horse: A trojan horse, sometimes also known as a gift horse, is an expression that signifies someone is not really what they appear to be. See Gift Dream Meaning for more details. This could be a sign that someone is trying to pretend to be nice when they might actually have intentions to do harm or take advantage of you in some way. You may be suspicious of someone in real life, or you may be questioning a person's true motives in a situation. You as the dreamer are the best person to understand what this dream means. By taking some time to write your dream down, you may be able to understand its meaning more easier. What Colors Are Present? Think about what color the animal might have been. White? Black? Brown? Purple? These colors mean something! You may also notice other colors in the dream, such as the color of a saddle or blanket. Where Does This Dream Take Place? The setting of a dream can have a lot of significance to what it might mean. For example, if it takes place in a city, this will have a different meaning than if it takes place in outer space on a different planet! What Are My Current Feelings About Strength, Energy, Power, and Freedom? Exploring these themes in your dream journal may help you identify how this might relate to your current life or some hidden feelings that may be surfacing. Did you have a dream about a horse? Tell us about your experience! Share your dreams about horses and what you think they might mean in the comments section below!